Recovering from the respiratory disease pneumonia can be difficult. According to the Merck website, the risk of relapse in patients recovering from the disease is high in comparison to other medical conditions. One method you can use to limit this risk is to practice breathing exercises. These exercises will help strengthen lung function to prevent further bouts with the disease. Speak to your doctor for more information on breathing exercises and pneumonia treatment. One technique of deep breathing that can be used to help prevent pneumonia is belly breathing. To begin this exercise, lie down flat on a smooth surface and place your hands under your rib cage. Next, take in a deep breath through your nostrils while focusing on how your abdomen pushes on your hands. Exhale your breath fully through your mouth, again noticing how your abdomen lowers back to starting position. Try to repeat this abdominal movement with your next breath. This technique focuses on using your diaphragm and stomach muscles to fill your lungs to capacity. 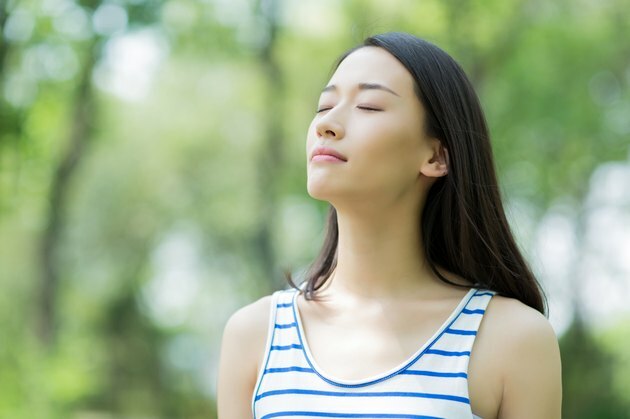 According to an article in "The Relaxation and Stress Reduction Workbook" by Davis, Eshelman and McKay (1982), another breathing exercise you can practice is the natural breathing technique. From a seated or standing position, inhale through your nose while focusing on expanding the lower section of your chest to start. Slowly expand the middle and top of your chest in succession next until your lungs are filled to capacity. Hold this breath for a few seconds before exhaling fully through your mouth, allowing your chest and abdomen to relax. As an alternative deep breathing exercise, begin by lying down on a flat, smooth surface with one hand on your chest and the other on your stomach. Next, take a normal breath in through your nose while noticing how your chest and stomach expand. Exhale fully through your mouth, again noticing the movement of your hands and body. For your next breath, try to breathe using your stomach more than your chest. If done correctly, the hand on your stomach will be higher than the one on your chest. Repeat this exercise as often as comfort will allow, according to the AMSA website.